A foodie friend of mine and I were talking quite awhile ago (six months?) about cooking vanillas. 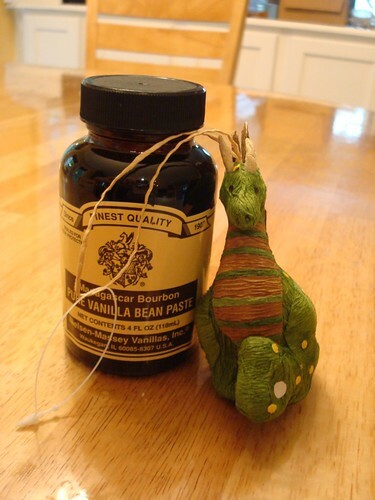 I used to get the most wonderful syrupy, non-boozey cooking vanilla from Trader Joes. And then Trader Joes stopped carrying it and then we moved to Alabama and there are no Trader Joes here regardless, and then the last of my hoarded vanilla ran out. So I was forced back to the land of regular ol' vanila. Which is very thin and very boozey. The wee dragon is adorable.